AmSafe is the world’s leader in aviation restraint systems and manufactures revolutionary safety products such as the patented seatbelt airbag and active-positioning structural airbag. AmSafe traditional restraints are specified as original equipment on nearly all of the largest commercial and regional airframe manufacturer’s aircraft: Airbus, ATR, Boeing, Bombardier, Embraer and more. Traditional restraint design and commitment to safety innovation ensures that the most advanced technology is available to every crew and passenger, no matter what type of aircraft they fly. 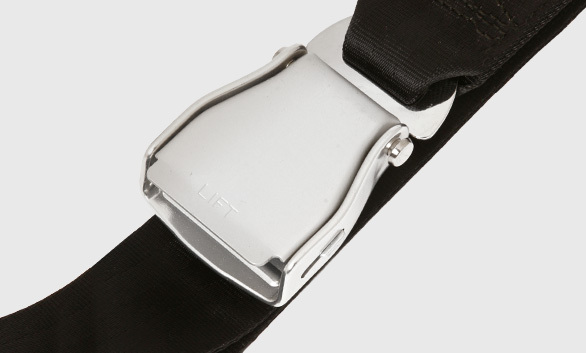 With more than 40 years in the aviation restraint business, AmSafe has delivered millions of passenger seatbelts worldwide. AmSafe utilizes advanced webbings, load limiting devices and dampened inertia reel mechanisms. From the industry standard 16g passenger lap belt, to the world’s first commercial, business jet and general aviation airbag system, AmSafe is ready to meet passenger and crew restraint needs with the most advanced technology available. Over 200 webbing colors, high quality nylon or polyester, custom plating and engraving – AmSafe is the clear choice of interior designers searching for the perfect restraint to compliment modern aircraft interiors.